NCEP welcomes Sapana, a new Scholar in 2011. 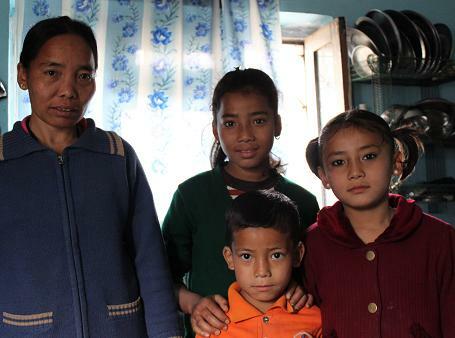 Sapana’s mother, Maya – who is uneducated – is the sole supporter of all four of her children, and counts on Sapana, age 12, to help look after the younger ones and household chores. When NCEP Co-Founders Raju and Sandeep recently visited the family, Sapana jumped from her seat to make tea for the guests, and has been a huge help to her mother over the past few months, which have been a particularly difficult time for the family. Maya worked as a cleaner at Shanti Sewag, a centre for persons with disabilities, but due to major funding cuts, she lost her job. Desperate, she took a new job as a labourer, but as a result of health problems, she collapsed within the first week and injured her leg. She currently has no steady income and is struggling to feed her family. Sapana has a younger sister, Bipana, who is a third-year NCEP Scholar (age 10), older brother, Akash (age 15), and younger brother, Krishna(age 7). Sapana is 12 years old, and will be entering Class 6. To make matters worse, Bipana – the younger of two daughters – was attacked by a stray dog in March, and was bitten in the face, just under her eye. She needed five painful injections to protect her against rabies, which was another major cost for the family. Throughout these ordeals, Maya has maintained a strong desire for all her children to attend school and have a life of opportunity rather than poverty. NCEP has stepped in to help this family in various ways, including referring them to the Chhatrapati Free Clinic for medical care, helping Maya to enroll in a paid skills training program for uneducated women to help her find stable and fulfilling employment, and taking on Sapana as a new NCEP scholar. Sapana is entering Class 6 at the Shree Bal Kumari Ni Ma Vi School, where Bipana is also a student. She is more shy than he younger sister Bipana, but is also very well-liked by her teachers, who describe her as a hard working and honest girl. She is passing her classes rather than excelling at them, but we believe she has the potential to do very well if she has the opportunity to focus more on her studies, as she will this year. She and Bipana walk to school each day, which is about 35 minutes away. While English is Bipana’s favourite subject, Sapana has difficulty in this call, and may require extra tutoring to provide her with a more solid foundation. We are counting on our Sapana and Bipana’s dedicated and conscientious Field Volunteers to support the girls and their family, and help us understand and address the challenges that they encounter. Clockwise from left: Mother Maya, Sapana, younger sister Bipana, younger brother Krishna. Clockwise from left: NCEP Co-Founder Sandeep, Bipana, Sapana, and Krishna.